In February 2005 Parliament passed into law a ban on "Hunting with Dogs" in England and Wales (The "Hunting Act"). The "House of Commons", acting for England and Wales, used the Parliament Acts to overrule the "House of Lords". In Scotland, power over Hunting had already been devolved to the Scottish Parliament and they had passed a Ban on Hunting in Scotland in 2002. Fox-hunting is not banned in Northern Ireland. Thus the Ban covers the whole of Great Britain (GB England, Scotland & Wales) but not the whole of the United Kingdom of Great Britain and Northern Ireland (The UK). The Republic of Ireland is a wholly independent state and has not banned Hunting with Dogs. Although attempts are being made and Southern Irish Hunts need the support of all those in Great Britain who stand up for Rural Culture. 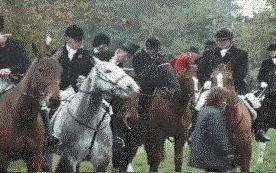 Foxhunting in Ireland is very strongly associated with the Way of Life of Rural People. This is a personal view and may not coincide with the views of organisations which support fox-hunting. Click on the links to see more detail. It was started in 1995 and put on hold in December 2004 after the passing of "The Ban" in England and Wales. It was restarted in November 2007 because there is now a realistic possibility of getting This Ban and that in Scotland repealed. Foxman hopes that this site will help in The Repeal and in resisting the current pressures to Ban Hunting in Northern and Southern Ireland. THIS SITE IS CONCERNED SOLELY WITH FOX-HUNTING AND THE "RURAL CULTURE" THAT BENEFITS FROM IT AND SUPPORTS IT. THE BAN SEVERELY DAMAGED OTHER TYPES OF HUNTING (E.G. MINK) BUT FOXMAN HAS NO DETAILED KNOWLEDGE OF THESE. There is hope that a Conservative Government would repeal The Ban. "The House of Lords" has shown itself to be open minded and to protect the interests of individuals and minorities. David Cameron (The leader of The Conservative Party) has the same interests at heart. He has stated that when returned to Government his Party will introduce a Bill to "Repeal the Hunting Act" and that "The House of Commons" will be allowed a free vote on the issue. Nevertheless, on the 26th of June 2008, the leaders of the hunting world, including professional hunt staff, supportive politicians and Alliance staff gathered in London for the inaugural meeting of the 'Repeal Committee', which will guide the campaign for the repeal of the Hunting Act in the run up to the next election. The committee is chaired by Edward Garnier QC MP supported by Lord Astor as vice-Chairman and, unlike both the Alliance itself and the associations that run hunting, it has only one purpose: to see the Hunting Act removed from the Statute Book. The new committee will oversee the work of lobbying MPs, peers and candidates; of briefing and engaging the media; and of ensuring confidence in post ban hunting. The members are well placed to guide, advise and engage all parts of the hunting community in the efforts that must be made to ensure the abolition of the Act. On 6 May 2010 the General Election produced no overall majority. The Conservatives acquired most seats and most votes. However the final compromise government is made up, it is unlikely that the Conservatives will be able to convince any collaborators of the need for early or any action to repeal the Ban. In view of the parlous state of the UK after 13 unlucky years of Socialist Centralised Authoritarian misrule, there are so many Socialist inspired "evils" to sort out and a Financial Crisis to surmount that it would be foolish for The Compromise Government to give Repeal any great priority. The good news is that the seats that were targeted by animal rights activists and anti-hunting campaigners were successful, whilst a series of high profile anti-hunting MPs lost their seats. The ridiculous claim that supporting the countryside and hunting have a negative impact on voters has been buried forever. Lib Dem Lembit Opik, a notable Pro-Hunting Liberal-Democrat MP, was beaten in Montgomeryshire. But his replacement, Conservative Glyn Davies, has impeccable rural credentials. Robin Walker (Con) with a majority of 2,982 replaces Michael Foster (Lab), former M.P. for Worcester and the sponsor of an Anti-Hunting Bill. It seems inevitable that there will have to be another General Election ere long. Therefore it is even more necessary to re-engage every person who hunts, and everyone in the country who supports their right to do so, in the campaign to scrap the Hunting Act. Scrapping the Act is not simply of benefit to the hunting community. The futures of other field sports, particularly shooting, will be secured indefinitely by repeal. In addition, the interests of rural and urban people who simply believe in a tolerant society will also be greatly enhanced. This committee will help steer hunting past the potential pitfalls of the next two years and to ensure that every last effort is made to prepare the ground for the early delivery of repeal. Years ago, as the Hunting Act became law, the idea that there might now be a realistic possibility of scrapping the ban would have seemed optimistic. In that time, however, it has been exposed as one of the most pointless, illiberal and incompetent laws ever to reach the Statute Book. The time is now right to put this failed law out of its misery and the members of this committee are ideally suited to that role. When we were fighting the introduction of the Hunting Act the entire hunting world, and the wider rural community, was engaged and active in the campaign. The last few years have been focussed on the ground to ensure that the infrastructure of hunting is maintained. Now is the time to start a renewed political and public campaign for repeal with the realistic possibility that the next Government will be willing and able to deliver. We have just one aim, repeal, and will have just one chance to achieve it. This new committee will ensure that no stone is left unturned and no avenue is left unexplored as we seek that goal. BUT, there are still many misguided people in Great Britain anxious to remove all forms of "permitted hunting", or to stop practices essential to maintaining the infrastructure of our packs of foxhounds. I sense some complacency and the behaviour of a minority of Hunt Followers (mounted, foot and car-borne) continues to be the worst threat to Trail or Fox Hunting after bigotry. Quite rightly, farmers and the general public resent thoughtless acts such as leaving gates open so livestock is risked, or roads blocked, grass verges cut up, etc. This complacency and indiscipline could be fatal to preserving the basis for a return to proper Fox-Hunting. In this context, I am reminded of an excellent BBC TV programme "Going for the kill" and I urge our supporters to get a copy of the DVD from http://www.sussex-southdowns-guide.com/going-for-the-kill.html It is one of the five documentary films made for the award-winning BBC 'Storyville' strand, entitled "A Very English Village". It was first transmitted by the BBC in Autumn 2005, and repeated in January 2007. It has received excellent reviews. This film is an excellent wake-up for those who believe that Fox-Hunting is safe from further legislation. It is part of an intimate record of a country village made through the dreadful days leading up to the ban and concludes with the first day of Trail-Hunting. Shot directly with the people most affected, it does not glamorize hunting, nor farming, showing reality in the raw. The integration of hunting with farming is well brought out. A back-drop of continuity in farms and village life through generations of the same families, adds poignancy to the display of feelings induced by the Ban: heartbreak, sorrow, resentment, rejection, victimisation, horror, disbelief; but, above all, anger and a determination to fight back. The camera work has a real sensitivity to the country scene and the DVD is of a very high quality. A modern message that can be drawn from this film is the intellectual dishonesty of law-makers, who can legislate against many types of discrimination, but discriminate against a significant cohesive factor in the society of country villages. This while trying to promote "Social Cohesion." Why a site on fox-hunting? The case against fox-hunting seems to me to be based on emotion not fact. Therefore, I would like to put before those who bother to visit this site a few of the logical reasons why I support fox-hunting. I am encouraged to do this by the fact that over several years four senior "officers" of the League against Cruel Sports have resigned from this well meaning but misguided organisation after learning a lot about hunting. Eventually, they became convinced that logic supported the case for hunting as preferable to other methods of controlling numbers. I feel, therefore, that all you Surfers deserve to be given the facts. You can then come to a logical view on this contentious subject. An overview of the Current Situation. The Background. An outline of the disgraceful waste of Parliament's time, weakness of government, deceit and bigotry that eventually lead to the ban. A proposal for defusing the subject for the longer term. The case for fox-hunting is taken as made. The particular reasons why The Hunting Act should be repealed. A page about each element of the case. D.Thoughts on how to counter the arguments and propaganda of those opposed to Hunting. E. An illustrated description of fox-hunting. Foxman hopes that you will enjoy a browse through the site. while providing a fox pest control service. The Hunts are followed by many people from all backgrounds and income levels. It was, and Trail Huntng still is, an important cohesive force in the social fabric of many parts of Great Britain. Fox-hunting also helped control the fox population where required by the owners of property that foxes kill. Furthermore; it created a more sustainable amount of employment and trade than Trail Hunting can. It contributed more significantly to the conservation of the landscape and its wildlife. Like Trail Hunting, it was well organised and conducted according to strict rules. Fox Hunting was and Trail Hunting is supervised by the I.S.A.H. (The Independent Supervisory Authority for Hunting). These aspects separately, or in any combination, would not have justified fox-hunting if it were evidenced that the fox population would have been better off without it. However, all the available evidence indicates the opposite. Play a clip of the death of a fox in seconds under several hounds. Properly organised packs are those operating under the disciplines of the Masters of Foxhounds Association and under the supervision of the I.S.A.H. (The Independent Supervisory Authority for Hunting). The MFHA and all Formal Hunting is supervised by The Independent Supervisory Authority for Hunting, made up of vets, ecologists, farmers, etc. Hunting with dogs takes place in all continents (except Antarctica) and many countries. It has wide Scientific Support, for example it has been approved as a method of scientific wildlife management by the California Fish and Game Commission and the California Environmental Quality Act (CEQA), in a State noted for its tough stance in protecting the environment. I have listened to all the debates in the House of Commons about banning fox-hunting, inter alia. They were characterised, on both sides of the argument, by a lamentable lack of knowledge of the subject and by a ludicrous level of emotion. There is no confidence that MPs came to a just decision because there is no confidence that MPs had studied the subject thoroughly before voting on the ban. I am delighted that The Government allowed foxes and all those involved in fox-hunting the courtesy of a proper government sponsored inquiry "The Burns Inquiry" . After all Clement Attlee's Labour Government instigated such an inquiry in 1949 ,which did not recommend a ban, and Parliament followed this recommendation. Please study the subject before "preaching " against, or in favour, of fox-hunting. Please be more tolerant all round; "Rurals" of our "Urban Sub-Culture" and vice-versa. Both sides please "cool it" so that the level of emotion is reduced throughout any debate. The Countryside Alliance, "www.countryside-alliance.org" which incorporates the British Field Sports Society, is leading the fight to save Hunting in the UK. They have an excellent site which covers some concise summaries of the sport and the case for it. 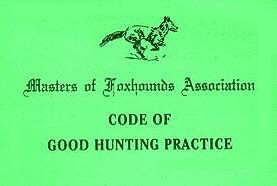 The Master of Foxhounds Association of the UK "www.mfha.co.uk" has a site linking to sites of UK Hunts. The Master of Foxhounds Association of America "www.mfha.com" has another excellent site which covers the USA and Canada. It explains the significantly different arrangements and rationale for Hunting there. The North American Foxhounds Association this is a "club" to which Hunts as such and individuals can belong. They have a Website but seem not to like to publish the address. If you want to contact them, please contact via the discussion group quoted below. Lots of information about hunting with hounds, including beagling and beagle field trials. Hunt club directory, news articles, audio and video clips. This Hunting site includes an extensive introduction to beagling, a year-long diary about a hunting pack, news and photo galleries plus the current status of the Wye Beagles which were dognapped by ALF in 2001. Support Fox Hunting - ban timeline, background material and the latest news coverage plus petition, poll and message board about fox-hunting in the UK, including necessity, history, rules, and research. An excellent site, rather similar to Foxman. Annual directory of over 750 hunts worldwide plus map of hunt countries, major hound show results, photographs, annual reports and special articles. Ordering information. A collection of songs, verse, quotes, photographs, illustrations and links. Especially good maps of hunting territories in the UK. Excellent links to Hunting Sites. A Bibliography of Research about foxes and the Trust's current projects, scientific publications, policy statements. I propose "Foxhunters On Line". A great discussion group. Email them to join in a worldwide discussion of everything to do with fox-hunting. A sensible and moderated forum for debate was at the UK Hunting Forum. The site still works but has been dormant since November 2006. Email Foxman Plese help me to sort you out from the Spam by including the word fox-hunting in the subject of your eMail. I will try and answer all but abusive mail. IN THE END THE ARGUMENT BOILS DOWN TO THE WISDOM OF RESTRICTING LIBERTY AND LIVELIHOODS BY DELIBERATELY ERASING PART OF THE CULTURE OF GB IN A MANNER CONTRARY TO TRUE DEMOCRACY.